순천 송광사 고려고문서(順天 松廣寺 高麗古文書)는 모두 고려시대의 유물로 절에 관한 중요자료이다. 지정된 유물을 보면 첫째,수선사의 창건연혁과 관련된 형지기 1점, 둘째, 수선사에 소속되어 있는 노비를 기록한 노비문서 1점으로 총 2점이 있다. 고려시대에 묵으로 쓴 글씨가 남아있는 것은 매우 희귀한 예로, 오늘날까지 원래 모습대로 보존된 것은 매우 다행한 일이라고 할 수 있다. 이것들은 고려시대 문서의 양식과 필법 등을 연구하는데 매우 중요한 자료로 판단된다. 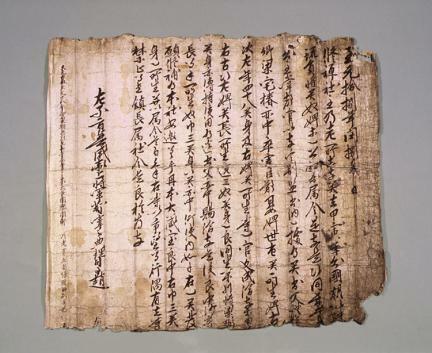 This set of two documents at Songgwangsa, dating from the Goryeo Period, contains important records related to this Buddhist temple. The two items together designated as a Treasure are one document recording the history of the temple and one nobi (slave) register listing the number and names of slaves belonging to the temple. Documents that are hand-written in ink like these, surviving from the Goryeo Period, are exceedingly rare. These two documents have been also extremely well preserved. The two items are of an inestimable value for understanding document and writing styles used in this period of time.